There has been a lot of talk recently over a rebranding of the comic book company DC comics. DC (Detective Comics: the name of Batman’s first appearance) is one of the largest comic book publishers in the world, with characters that are recognised across the world and as such features some of the worlds most popular comic book heroes. The logo that many relate to DC books was known as the ‘DC Bullet’ and was designed by one of the most famous Graphic Designers of recent history, Milton Glaser. 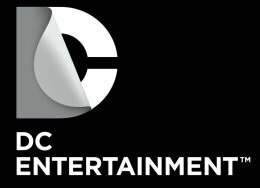 This was replaced as recently as 2005 by a logo created as DC became part of an expanding Warner Bro’s project, to incorporate DC characters into other media such as film. The new logo was designed by Josh Beatman of Brainchild Studios. I always felt that the Spin logo ignored the heritage of the firm by trying to look digitalized where it would have made more sense to look into the history of the company and try to incorporate the traditional printing process. Now DC have under gone another rebranding. This new branding puts the image in the mind of a hero taking the mask off themselves, revealing themselves. The design was created so that it could be interactive when portrayed in a digital format and Amit Desai, senior vice president of franchise management had this to say about the branding. The use of touch elements was also shown on the rebranding, with a description saying how the user could pull back the D to reveal a character or the character’s logo. The other aspect of the design is its customization. The C of the logo can be fully customized to the colors of the character or story it’s promoting: silver and gray for the corporation, blue for DC Comics, or–as suggested by the graphic below–sparks for The Flash, green for Green Lantern, or a mist for Batman. All are unified by a common font–the serendipitously named Gotham Bold. Some of the main complaints from the public around this rebranding is its similarity to the branding of the TV station over here in the UK: Discover History. I see what they’re trying to do. Personally they’ve had that logo for years and it would be a shame to remove it. The ‘improved’ logo I feel is just too …sophisticated and professional if you will. There’s no reason why they can’t make the current interactive I think.